Sally Hansen Lustre Shine in Copperhead Swatches + Review! I’m so sorry I’m so behind with all my Lustre Shine swatches, I’ve had a really terrible time with my computer lately. Expect to be spammed with them all ASAP! This is my LEAST favorite of the bunch, read on to find out why! 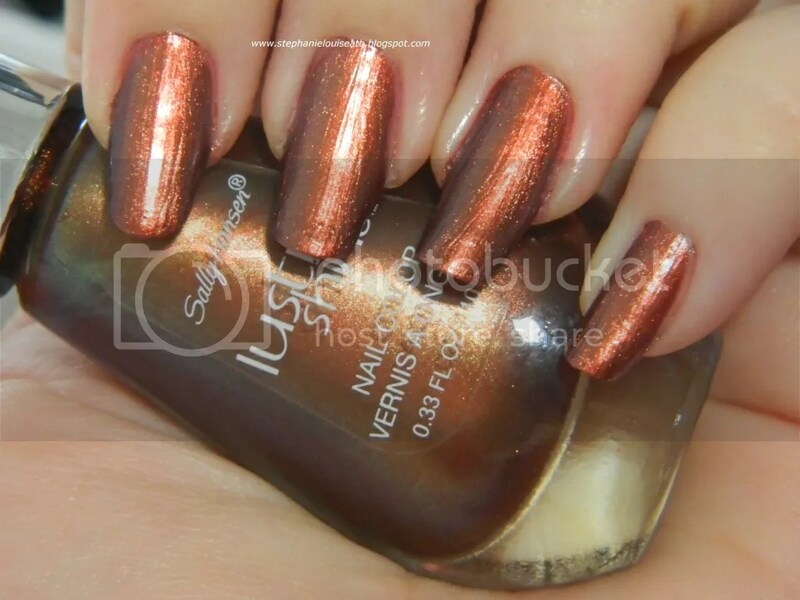 Copperhead Sally Hansen Lustre Shine: A somewhat metallic copper with pink & bronze tones. Applies as more of a metallic but with little to no visible shift. Seen here is 2 even coats of easy application. See what I mean? It is pretty, but I really think it is a dud compared to the rest of the Lustre Shines if you’re looking for a color shift. As far as bronzed coppers go, pretty, really it is. But as far as compared to Lava or Scarab, pssshhh puh-lease. What do you think? Is this pretty enough for you to pay the heavy price tag? (More on the other shades & bottles shots + prices can be found on a prior post!) Is this a color that you love or is this one to pass on? Sally Hansen Lustre Shine in Plume Swatches & Review Sally Hansen Lustre Shine Swatches in Moonstone & Firefly (FINALLY!) Sally Hansen Lustre Shine Nail Polish in Lava Sally Hansen Lustre Shine in Scarab Swatches + Review!